Fold bananas and pecans into topping. Sprinkle with cinnamon and chill before serving. As bananas ripen, the starch in the fruit turns to sugar. Therefore, the riper the banana the sweeter it will taste. Some horticulturists suspect that the banana was the earth's first fruit. Banana plants have been in cultivation since the time of recorded history. One of the first records of bananas dates back to Alexander the Great's conquest of India where he first discovered bananas in 327 B.C. In celebration of the International Talk Like a Pirate Day. Inspired by Elvis, there is a new limited-edition candy bar on the market. A Reese's Peanut Butter and Banana Creme bar that is actually quiet tasty. If you have a sweet tooth, definitely check this one out before they pull it off the market. The right banana at the right time. My favorite is when its yellow with no spots. What is yours? 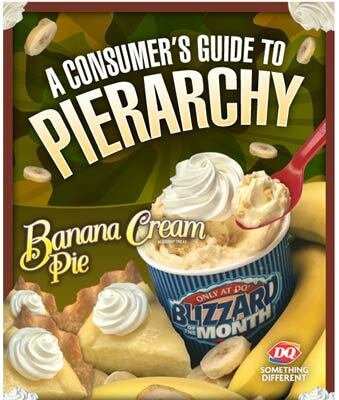 I just received notice via email that Dairy Queen is now offering the Banana Cream Pie flavor as Blizzard of the Month. I think that it may be time to revisit Mr. DQ and try myself one of these. Let's hope its real banana and not that artificial flavoring. Cold Stone Creamery has real tasting banana ice cream. It is not immitation banana flavoring that ruins the treat. This is packed full of real bananas that simply taste great. Ever wanted to know how to make banana flavoring? Click here to find out! 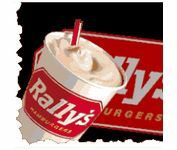 For those who do not have a Rally's hamburger shop in your town, it is simply another fast food restaurant that serves up burgers, chicken sandwiches and fries. It has been years since I had last been there but it's time was due and I made a stop in over the weekend. I immediately picked up on the banana shake that they offer along with the standard chocolate, strawberry and vanilla flavors. I talked myself into getting one of the banana shakes but unfortunately I was quickly disappointed. I have made numerous complaints in the past about the fact that artificial 'banana' flavor taste nothing like a banana. This was the unfortunate case at Rally's as well. They must have had a vanilla shake with a bit of the terrible banana flavoring squirted in. I was disappointed after my first taste but decided to finish it anyways. 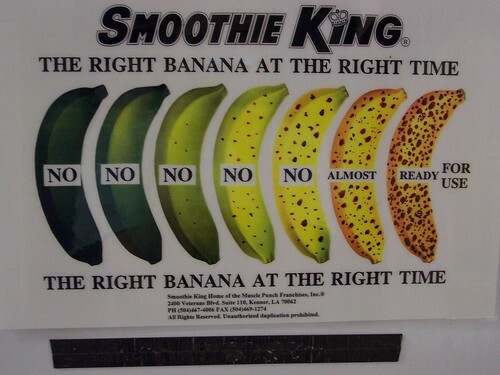 If you are perfectly fine with the fake banana flavor that is commonly out there, I would recommend trying one of the Rally shakes but if you are looking for a real shake with real bananas, you will quickly be disappointed. Btw, for those interested, the burgers and fries are great. As a graphics and web designer, I am always on the lookout for new font styles. The art of typography is growing tremendously over the past couple of years and just about anyone can make their fonts. Thanks to DaFont.com for having such a great collection of fonts. Usage: Eat fresh, baked, or add to fruit salads or desserts. Information: Also called a Chunky banana, this banana looks like a regular banana but is shorter and more square. The flavor of the burro banana is a tangy lemon-banana mixture. When ripe, the skin of the burro banana is yellow with black spots. The flesh is creamy white or yellow and the fruit will be soft with some firmness toward the center when ripe. 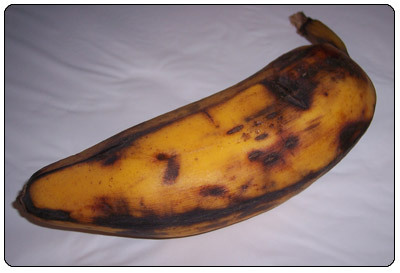 Avoid: Avoid bananas with soft spots, black or moldy stems. Gray-yellow or dull yellow bananas are an indicator of improper temperature handling and will probably not develop full flavor. I totally missed this Flickr image for the 4th of July. It turned out great and I imagine it tasted just as good. I don't know about you but on my way to work, I come across street corners with panhandlers looking for money (How they survive the Arizona heat is beyond me). 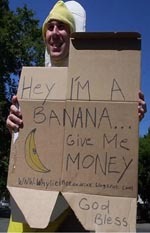 Have you ever spotted a man dressed up in a banana outfit looking for money? No? Then you must not have been at the right place at the right time. The guy actually stood out on the corner of multiple places while dressed up as a banana in an attempt to see how much money he could gather. I came across this painting entitled Life of a Banana a few weeks back. It just hit me as one of my favorites from an online gallery of Seth Minkin. The colors are simply perfect for this painting. The only question is, where can I purchase it? Interested in seeing more of Seth Minkin's work? Check out BzzAgent for the entire gallery. It is definetly something worth checking out. "Genuine Caribbean Taste," from Grace Foods of Richmond Hill Ontario. Uh huh. Well, it tastes just like banana. Carbonated. Not much more to say. Like bananas? You'll probably like this drink. I like bananas. 8 out of 10. ... Okay, I can say a bit more. It's not sickly sweet and syrupy the way many soft drinks are. I found it to be relatively light, and it went down quite smoothly, which is why it gets an 8 and not a 7. From a recipe in "The Joy of Cooking". Adding half a teaspoon of vanilla essence makes a difference. I have been a fan of Foodcandy.com for a while now and just recently got invited for an interview. I was quite excited as this was my first online interview related to blogging. I was not expecting the barrage of oddball questions however. What types of questions would you ask for someone who blogs about bananas? This must have been the question going through dblock's mind when preparing for the interview. For those who do not know about FoodCandy.com yet, it is a place for foodies to unite and talk about the food that they love. I would certainly recommend checking it out. Interested in reading the interview? Check it out here! 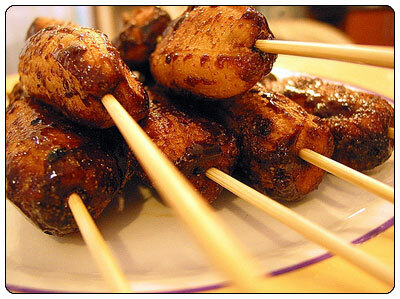 Banana cue is simply saba (cooking banana, similar to plaintains), rolled in brown sugar and then deep fried. The hot oil caramelizes the sugar, giving the banana cue an ooey-gooey, (careful not to bite into it while it�s still hot!) crunchy quality. Who ever said 'God' didn't have a sense of humor? I need to keep my eye peeled when I am passing through the grocery store for one of these. I am really curious to see how its taste was affected. A while back, I posted a video of a young guy singing and dancing with the Banana Phone song. I now present you the lyrics. Sing this song in your office and watch your coworker's ears perk up. for us to get together and sing - SING! Banana Ketchup - Who knew? Yes you did read correctly. Banana ketchup. Ketchup made from bananas. How glorious. It was an English lady, a farmer's wife who informed me about the existence of Banana Ketchup. 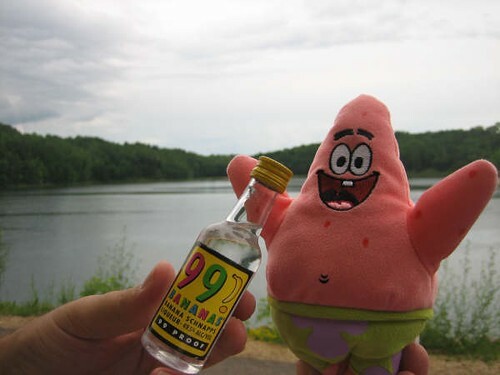 She discovered it on one of her holidays to the Caribbean. I suppose the St. Lucians have known about this gem for years. She suggested the St. Lucian economy could benefit if this product became widely available in the UK. It just goes to remind us that there are some unique products in the different islands of the Caribbean, that we need to ensure reaches the British market. Banana ketchup is really a healthy choice product, manufactured with 100% banana fruit (no tomatoes). This product is rich in potassium which is excellent for health. There are 2 varieties, one red, made by Viking Traders, the other which is yellow is made by Baron Foods. Both companies are St. Lucian companies. I'd say this is the best version. It is manufactured by Baron Foods of St. Lucia. No colouring is added. It is yellow as you would expect from the colour of bananas. The ingredients are banana pulp, garlic, onion, salt, spices. It tastes divine. It adds an exotic flavour to marinades, barbecues, grills or any dish. It is also excellent as a dip. Baron Foods have a division in London. 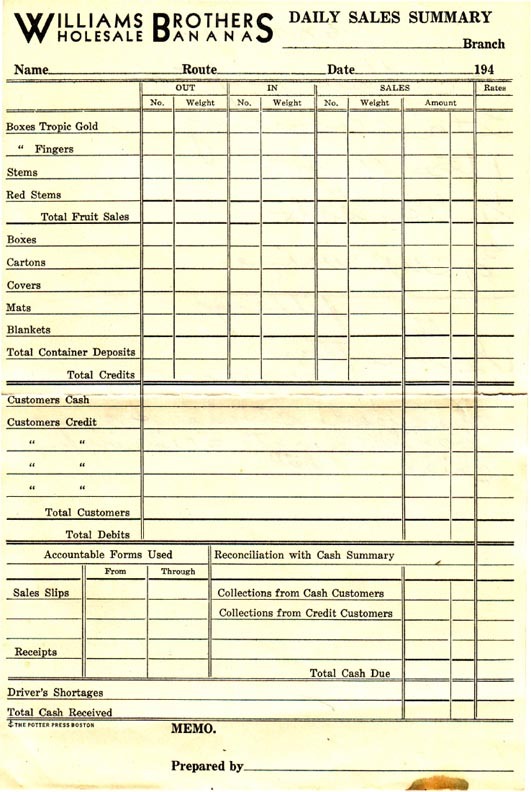 See the supplier list for contact details. Banana ketchup is manufactured by Viking Traders Ltd. in St. Lucia. The wonderful distinctive flavour is produced with a blend of spices and herbs together with pure bananas. In order to market this product as a ketchup, Viking Traders decided that red colouring had to be added. The seed of the Anato is used to give the rich red colour, this seed is considered to be nature’s most purest food colouring in the world. I am a bit bummed out that April 19th came and passed and I did not get to celebrate the festivus Banana Day. It appears that the West Chester University began this tradition back in 1997. For those interesting, Banana Day is the 3rd Wednesday in April. This would have been a great opportunity to try out some banana beer. I guess I will need to wait until next year. In the meanwhile, read this.. The idea of Banana Day was conceived by a West Chester University student named Rodolfo P. Tellez, (Rudy) during his Senior year in 1996. 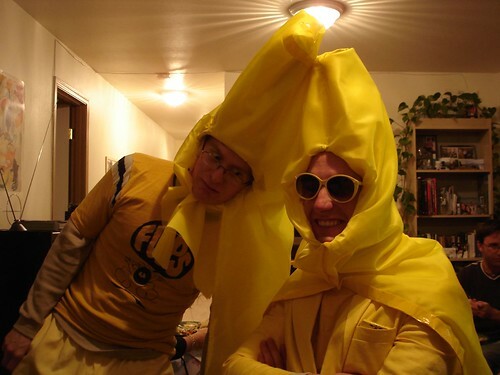 After some planning and many confused looks the first Banana Day became reality and 3,000 bananas were distributed campus wide and over 50 hours of community serviced were completed. In 1997, another student by the name of Robert Perino took on the project of organizing Banana Day. After months of planning and many confused looks, the Second Banana Day came to life. 1n 1999 Banana Day came back to West Chester University, and for the past 4 years now it has provided tons and tons of laughs! over 28,500 bananas have been given out (Free of Charge). Over 300 hours of community service have been completed, over 500 t-shirts have been giving out (Free of Charge), and millions of people in the tri-state area have heard or seen via radio magazines, newspapers and television about this day. 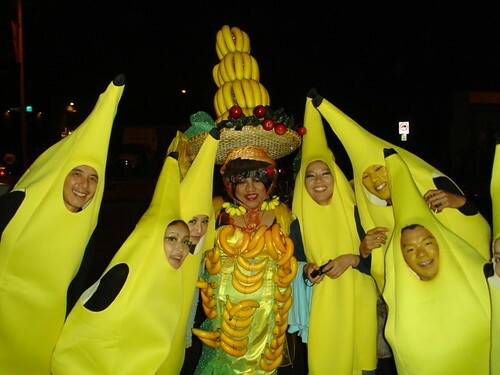 In 2000 "Nana" and "Nanner" were introduced as the official mascots of Banana Day. Students are selected from a group of volunteers to greet and get people excited about Banana Day. There is not a single face that does not light up with a smile the moment they see these two characters. The summer is quickly approaching and if you are deciding to take your family on a vacation, you may want to stop by the Thorpe Park located in Certsey, Surrey, England. 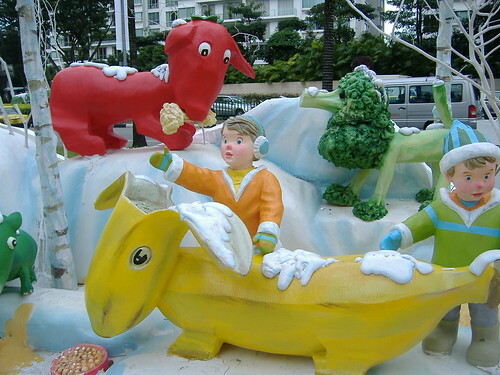 The park was build in 1979 and has the perfectly named ride entitled Mr. Monkey's Banana Ride. 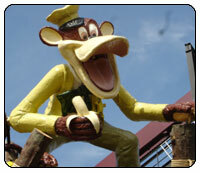 Mr. Monkey's Banana Ride is a twist on the typical pirate ship ride except that instead of a ship, it is a banana. An ingenious idea if I do say so myself. From what I have read, this ride is smaller than your typical pirate ship so that it is less frightening and more geared towards chidren. 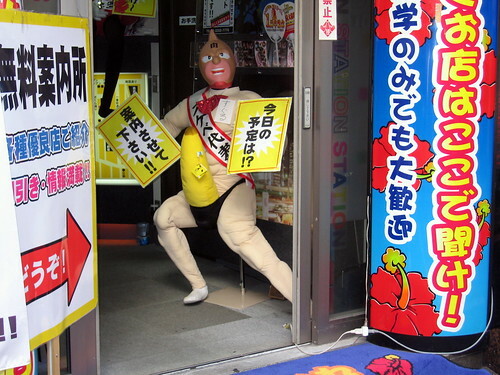 The very unique safety warning sign reads, "Please keep your arms and legs inside the banana.". What better ride can you ask for when one such as this involves bananas. I really need to check this place out. Welcome Gizmodo readers. 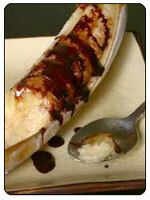 You are now looking at The Yummy Banana, a website dedicated to all things banana related. Presented below, I have listed a few of my favorite posts. 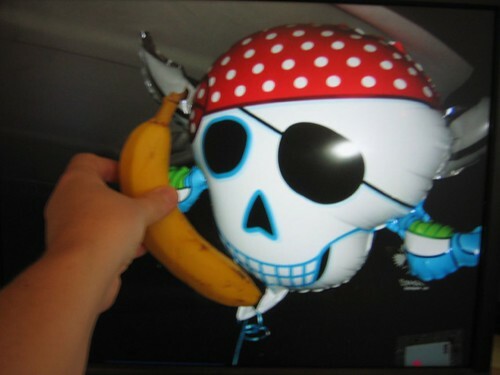 I encourage you to look around and possibly submit your own banana picture. 10 things you may not have known about bananas. There is no doubt that on flickr you can find some great pictures. This was one of them. 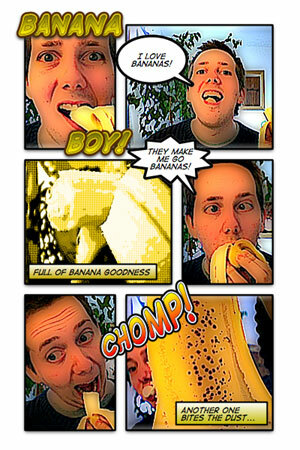 I had never seen a comic like this but the fact that he calls himself the Banana Boy requires me to post his image up. This is a requirement in my contract. Anyone else want to make us a comic strip to post? Send us an email. I was out at the local Cost Plus World Market here in town when I noticed what appeared to be one of the best looking bubble blowers I had ever seen. A Banana shaped one that is. A banana that blows bubbles. Simply amazing. After purchasing it, I had a chance to try it out and it really works well. This is not your normal bubble blower but one that creates a lot of bubbles. The fact that it is banana shaped makes this all the better however. Add this to my collection off oddball banana related items. MONTHAN - A cooking type from South India. Similar to the Bluggoe or Orinoco in size and versatility. Height about 10-12 ft.
PELIPITA - A dark green plant that grows about 10-12 ft. tall and produces a cooking banana that is angulated in shape. It is a hardy plant resistant to disease, which is why it is used as a progenitor for many other hybrids. POPOULU - A 12-14 ft. Polynesian cooking banana with superb flavor. Its short stout fruit and dark green foliage make it a magnificent looking specimen as well as great tasting treat. SABA - The "sequoia" of the banana plants with huge pseudostem (range 12-24" diameter) and heights ranging from 16-20 ft. here, however clients have reported even greater heights in other areas of the country. The wonderful tasting cooking banana makes the best tostones we have ever eaten. A sturdy plant and somewhat cool tolerant. (A must for the collector). KOFI - From Papau New Guinea, a member of the Iholena sub group which is a combination cooking-dessert banana that rated highest in the TREC tasting tests. 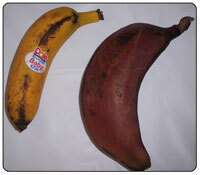 MAQUENO - A cooking banana from Ecuador, has a solid greet stout trunk with chubby 4-5 inch fruit. Height 12 ft. The plant is resistant to sigatoka and other diseases making it a good substitute in countries where this is a commercial problem. Here are 6 types of bananas used for cooking that you may have never heard of. BALONGKAUE - (pronounced ball long coo) is a cooking type, which grows about 12 ft. tall. The fruit has a bluish/green outer appearance, with white flesh. Is a very sturdy and attractive plant that can be eaten out of hand when very ripe. CARDABA - A Philippine cooking variety that is a truly an attractive plant with a bluish hue to the fruit and very white pulp. The fruit is stubby and irregular in shape but can get quite large. Height 10-12 ft. DWARF & TALL ORINOCO - Named from the region in South America near the Orinoco river where they grew profusely, they are also called the horse banana or "burro". 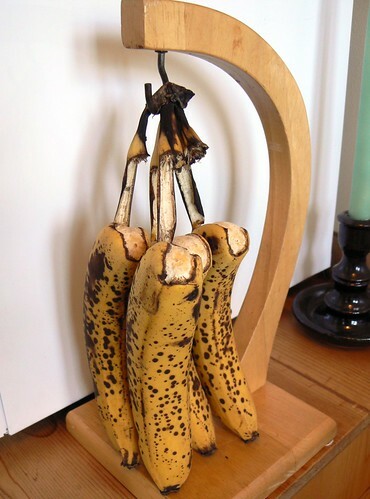 These angulated cooking bananas are also a tasty treat out of hand when fully ripe. Their versatility make them popular in many regions of the world. Height 5-6 ft. dwarf & 12-14 ft. on the tall. ELE ELE - A Hawaiian cooking variety that is known for its very dark pseudostem. Sometimes called the Hawaiian Black, it gets a purplish hue, especially in more acid volcanic type soil. Full sized fruit. Grows about 14 ft. tall. HUA MOA - A Polynesian cooking banana that is short and stubby but packed with flavor. These make wonderful tostones and maduros as well as other banana recipes. The large full leaves and fat, rounded fruit make this a great looking plant. Height about 12 ft.
MAIA MAOLI - This 12-14 ft. tall plant of the Polynesian cooking variety has delicious flavor and statuesque elegance. It is mostly green with slight red colors in the pseudostem giving serious competition to the other cooking varieties. Looking for a terribly annoying way to show that you love bananas? Check out these animated bananas. What better way to annoy all of your website visitors than to cover it in animated images. Yeehaw! Check out this site for even more. Brian from the CandyAddict.com just gave me the heads up on a news wire that came out fresh today. Hostess, to tie into the DVD release of King Kong, will be selling banana flavored Twinkies(R). These are limited-edition Twinkies(R) that contain the original banana creme flavor that they used to be filled with. Starting today, over 30,000 retail stores will be selling these boxes. For those of you are are not in the know (like myself), Twinkies(R) used to be banana creme filled until World War II. During this time, a banana shortage caused Hostess to change to the now vanilla creme. Hostess will also be releasing limited-edition Banana Walnut Mini Muffins. I think that I need to add a few new things to my grocery list and give a proper review of each of these new treats in days to come. Look forward to those future posts. How to grow bananas Plants and Trees. The first priority to consider when growing banana is to use the proper soil. It is very important to use a well draining soil MIXTURE and 20% PERLITE should be added to it to assure that you have good draining soil. Do not use heavy soils when growing banana such as potting soil, or soil from a yard. Plant the banana rhizome upright and be sure the roots are well covered and the rhizome has about 1/2" of the base covered with soil. We advise that you water and fertilize banana at the same time using any type of balanced fertilizer to help grow banana. Bananas are heavy feeders so we suggest that you fertilize very lightly each time that you water with the exception being that you do not fertilize if you are not seeing active growth. ( Balanced fertilizer means - a fertilizer that has three numbers on the label ). After your initial watering we would not water again until your soil is dry to a 1/2" depth. ( Use your finger to test it ). Please do not expect this to be a plant that you "water once a week". If you water once a week it is unlikely that you will have success growing this rhizome. Grow banana in BRIGHT LIGHT. 12 hours of bright light are ideal for most varieties. When you walk into a store and head passed the candy section, it is not uncommon to see banana flavored candy. These could be anywhere from banana flavored taffy to hard sugar candy. While these may not necessarily be the most popular of candy, there are certainly a large amount of people who do enjoy them. I too was one of them and most likely still am. The reason why I say all of this is because a question popped into my head the other day and I've been wanting to get it out there for others to hear. Why do banana flavored candies taste nothing like a banana? There I said it. Its a valid question I think. Where do these candy manufacturers get their bananas from because from where I live, I have yet to taste a banana that was like it. Do I dislike the banana flavor of these candies, not necessarily, but I am still curious as to who approved this flavor. Does anyone else agree with me or am I simply nuts here? Leave a comment and let me know. Tattoo'ing a banana, what? Yes, that is what I said. 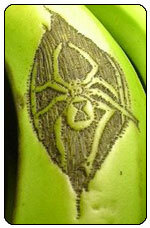 The Tattoed Banana is the 'only site you will find dedicated to the emerging appreciation for banana art'. This website certainly caught my eye, not only because of the brilliant idea for it but the art that people send in is truely amazing. While the majority of the art seems to be people drawing onto the skin of a banana, you can also find peoples designs done with poking the banana. There are definetly some people who put more effort into their submissions than others but overall, its a great project and just confirms that bananas are mainstream. Everyone loves bananas regardless if you eat them or not. I don't know about you but my job can certainly drive me bananas sometimes. All of the built up stress caused by a workload bigger than the eiffel tower can certainly put a damper on you. Welcome the Banana Stress Toy by Office Playground, Inc. This foam replica of a real banana is what they consider a novelty item that works great at your desk. Simply squeeze the banana for general stress relief. I don't know if I would use this at my desk at work, but certainly at my desk at home. I come home each day and sit at my desk researching the best banana related news and items that I can find. Now that can be stressful! 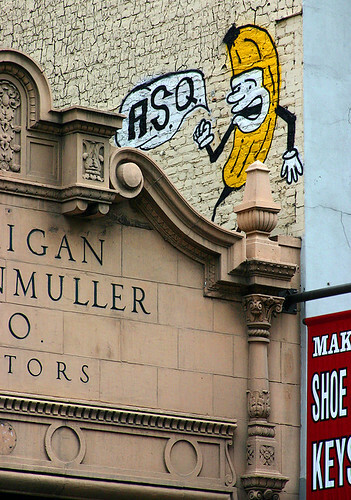 For those interested in writing your company name on a banana stress toy, click here. Bananas are the number one selling fruit. Bananas were introduced to America in 1876. Bananas grow on giant herbs rather than trees. Banana leaves can extend up to 30 feet in length. Beer can be made from bananas. The average person consumes an estimated 33lbs of bananas annually. Bananas are considered natures remedy for many illnesses. Bananas have 4 times more protein than an apple. The peel of a banana can be used to remove a splinter. First off let me say, The Yummy Banana loves to hear stories about peoples lives and how bananas have been related to them. If you have such a story, please email it to us by clicking here. I was contacted by Paul Williams, grandson of a man who started the Williams Brother's Wholesale Banana company. The Williams Brother's Wholesale Bananas originated back in the 1940s where Paul's grandfather and his brothers "would pickup a truckload of bananas that were unloaded off the boat in Manhattan. The drivers would then deliver up through New York City and into Connecticut". They continued to sell bananas up and down the eastern coast in the 1940s and 1950s. The story does not tell why the company stopped doing business and furthermore, it seems that the Williams family does not have much information on this company as the grandfather has since passed away. I call out to all of the Yummy Banana readers and ask that if you have any information on the Williams Brother's Wholesale Bananas, please leave a comment. We would love to know further information on this great story. Paul has been kind enough to show us a bit of history with this picture of an original Williams Brother's banana crate and an order form (click on image to enlarge). Stimulate your baby's senses with the Anna Banana toy from Tiny Love! This colorful banana toy is perfect for developing fine motor skills and hand-eye coordination. Features include rattling feet with mirrors, soft teethers for chewing, springy arms and legs for pulling, a hidden squeaker rattle, and crinkly banana peels that actually pull away simulating real peeling! Flexible ring will attach to car seats, stollers, high chairs, and more!. With a 4 month old son that is moving into enjoying his toys more and more everyday, I think this would be a great toy. The selling point for me, besides the fact that is a banana, is that it has a ring that will attach to our other rings which my son loves. I think that this toy will certainly be in his collection in weeks to come. As it likely is in other parts of the country, it is difficult to find different types of bananas. Your standard yellow Cavendish banana is what you will likely see at your local grocery but this last weekend, my wife and I were able to get out and go to a gourmet grocery store. At this store, we were able to pickup a few baby bananas and red bananas. These were my first attempts at eating such bananas and I am happy I have tried them. While at this time, I still prefer the Cavendish bananas, these new bananas will have a certain place in my kitchen and allow me to try a few new recipes as well. Here are a few facts on each of the bananas. Red Bananas - These short, chunky bananas have red skin. When the skin starts to turn purple they are ripe and ready to eat. Red bananas are very sweet and creamy. Some people think they taste like a cross between a Cavendish banana and a strawberry. Baby Bananas, also known as Oritos, Lady Fingers and Manzanos, received their name because they resemble the hands of small children--plump and short. These subtropical varieties of bananas are grown at higher altitudes. The peel has a yellow-pinkish cast. Quite sweet, these bananas taste best at full ripeness, when the peel is freckled with sugar spots. I read a lot of blogs during the day and many of them are food related. When I came across BrowniePoints, I had no idea that I would be reading an article about carbonated bananas. What are carbonated bananas you ask? Well, it is bananas that have been frozen with dry ice. Once thawed out, they are said to have a tingly carbonated taste. While I am not sure likely I am to try this, it seems interesting. If you are interested in further information on carbonating your bananas, or many other fruits, check the post here. Every year here in town, they have an event that they like to call the 'Chocolate Affair' however this year, I nicknamed it the Banana Affair. The reason for this is that quite a few of the booths had bananas included in their menus. 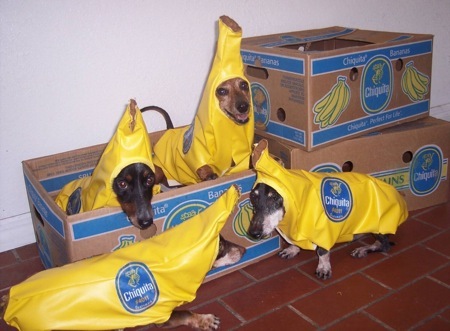 If they continue to have bananas, I will continue to go try out their goodies. The first thing that caught my eye this year was a booth filled with food related magnets. I quickly walked towards the tables looking for a banana. What did I find? A nice looking banana that would work great on my fridge. Next up are the food booths. I regret not bringing more cash so that I could have tried more of the food selection. The San Francisco Chocolate Dipped Bananas looked great and people seemed to be buying them all up. The workers seemed to have a hard time keeping up with the demand. You had a choice of dipping them in chocolate or rolling them in nuts as well. There was no clear winner on which banana type was being purchased more but I think I would have gone with the simple chocolate dipped banana minus the nuts. Where do I start on this one? Well, I decided since it was a hot day here in Arizona, I would try a Chocolate Banana Yogurt Shake and unfortunately I should not have. The first sign that something was wrong was when I noticed that my shake had been sitting there while other peoples were freshly made. The taste of the chocolate was terrible and the banana had an awkward taste as well. Overall, I was not pleased. To finish the day off, we walked by a Maui Wowi booth which sold Daiquiris and Smoothies. Unfortunately for me, I had spent my money on an awkward tasting shake when I should have held out for one of these smoothies. The Banana smoothie certainly looked more pleasing than my shake did. For anyone who has tried to peel a plantain, you know it can be extremely difficult. In fact, many people would say it takes good knife skills to get the job done correctly. I can confirm this as my last plantain was basically butchered. Welcome the E-Z Plantain Peeler. Their website describes it as, "The E-Z Plantain Peeler is a hand held tool made of durable plastic with a stainless steel blade and an attached blade protector. This tool was specifically designed to facilitate the tedious and antiquated way of peeling green plantains. This utensil protects your nails and cuticles from becoming sore." I recently came across this product on a NYTimes.com article which laid out a bit of the history of this product. His original prototypes began as a block of wood and after 12 years, he finally has a finished product that is ready to be marketed. I have to say, there are a lot of kitchen utensils that are necessary, and some that are not, but I certainly believe that this may be considered one of the necessities. I can see many people trying to figure out how they peeled a plantain without one of these. For $9.99, I don't see how you can go wrong. I have noticed a huge increase in popularity of the E-Z Plaintain Peeler. Please leave a comment and let us know where you first discovered about it. Thanks alot! I have to apologize for all of your banana lovers out there. 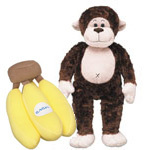 I missed this opportunity to inform you all that Build-A-Bear over the weekend was giving away a free plush bunch of bananas when you purchased the Marvelous Monkey. They were having a 'Go Bananas!' promotion and I have to say, they made the bananas look really cute. Normally the bananas go for only $2 so I picked some of them up on their own. Its hard to pass up such a cute little bunch of bananas. I think I will hang it from my cars rear view mirror. As a kid, there were a few things that I collected including sports cards and pogs but one thing that I most certainly did not was the stickers from bananas. While I enjoy most anything banana related, banana sticker collection was something new to me up until recently. It appears that many people have collections topping 5000 banana stickers. My question to them is, did you eat each banana you got a sticker from or did you simply take it off of the banana from the store? Here are a few links to some of the impressive banana sticker collections. Two young children, Jimmy and Susan, (who had never seen or eaten bananas) were on a train. Seated opposite them was a soldier who had just come back from duty in the tropics. He had in his lap a bunch of bananas. Jimmy asked the soldier "What are those yellow things?" The soldier explained that they were bananas and asked the children if they would each like to have one. They eagerly said "yes". The soldier then showed them how to pull down the peel to get at the banana fruit. Just as Jimmy and Susan took a bite of their banana, the train entered a dark tunnel and the carriage interior was pitch black. Jimmy then cried out "Susan, don't take a bite out of yours. I've just gone blind." Thanks to Mike Lomas for providing us this joke. Living here in Arizona, I feel a bit bad that I had never seen this place before. 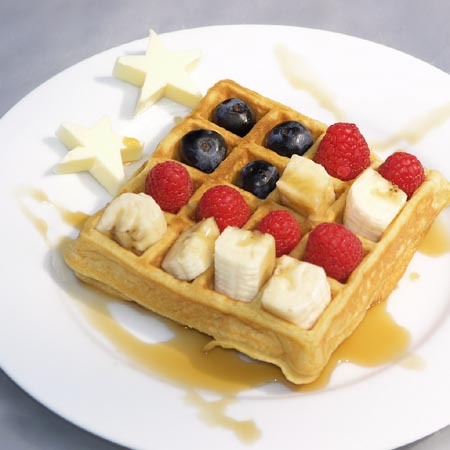 Cereality is a cereal bar and cafe that caters to the people who love breakfast cereals. Cereality sells cereal and other breakfast related items throughout the day while their employees dress in pajamas. With a company who offers dozens of different types of cereals, you may be asking yourself, can you put bananas on top? The answer is yes! In fact, you can even create your own cereal mix and save it for future visits. Cereality currently is in 3 markets including Arizona, Illinois and Pennsylvania. I would certainly suggest all you banana topping cereal lovers check this place out. It's certainly one of a kind and a brilliant idea. How many other places can you stop by and watch your morning cartoons while eating your own custom cereal blend? Simply brilliant. 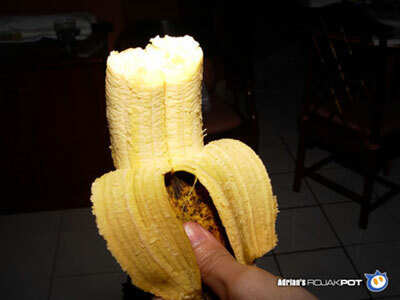 It truly is amazing what you can come across while surfing the web and this just happens to fit perfectly with The Yummy Banana. 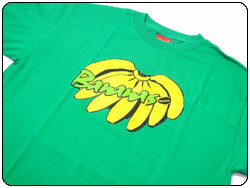 BitterSweet sells this shirt which easily reads Bananas and has an image of a banana bunch on the front and back. It appears though that is only sold out of Japan so for you people with the Japanese hookups, start making some deals. It looks like they come in all your normal sizes such as medium, large and extra large and a choice of white or green. If only I could figure out how much money these shirts cost. Welcome to Branson, Missouri, home of the Happy Banana Restaurant. My wife and I were in the area while out on vacation recently and we happened to spot this from the road. What a great name I told my wife as I made a quick swerve to make it into the parking lot. We were not sure what were getting ourselves into as its not too common finding a Cajun restaurant in Missouri. We were pleasantly surprised however when we walked in and saw a great looking place. They have a full menu with some great dishes like the Jamaican Jerked Chicken Sandwich and their Fillet Mignon is great as well. My wife got to sample a few of their specialty tropical drinks and she says they were great as well. From all accounts, this is a great place to stop if you are in the area. I would highly recommend it. 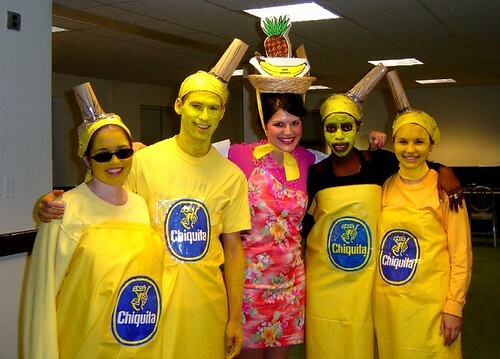 Here are the words to the original Chiquita Banana theme song. Bananas taste the best, and are the best for you. You can put them in a salad. You can put them in a pie - aye. Anyway you want to eat them it's impossible to beat them. But bananas like the climate of the very, very tropical equator. So you should never put bananas in the refrigerator. Bananas are America's #1 fruit. The average American consumes over 28 pounds of bananas each year. Over 96% of American households purchase bananas at least once each month. There is no such thing as a banana tree. Bananas grow on plants. 3 medium size bananas weigh approximately 1 pound. Most everyone can agree that professional wrestling is fake, or atleast choreographed. Take professional wrestling and exaggerate it ten fold and you enter the world of the Kaiju Big Battel. There is no better way to explain this than to pull from their website. Kaiju Big Battel is a modern conflict of epic proportions. Planet Earth is under threat: scattered throughout the galaxy is a monstrous mob of maniacal villains, menacing alien beasts, and giant, city-crushing monsters that are waging war against one another. Presiding over this mayhem is the Kaiju Commissioner, an enigmatic human-arbiter appointed by a clandestine cadre of world leaders to regulate Kaiju rage. If the Kaiju Commissioner doesn't do his job perfectly the entire world could get caught in the crossfire. Where do the Los Plantanos come in you may ask? They are part of the 30 monster roster who participate frequently in the arena. These plantain dressed characters have wicked attacks such as the Cuban clothesline, the plantain roll and the double hurricane. Hailing from the deep jungles of South America, these twins grew up in a land with bright fruit and vegetable haters. They became freedom fighters and migrated to America where they now wrestle to fund their family. There are times throughout the year that bananas go on sale and I like to stock up while I have the chance. The problem with purchasing a large amount of any food is the ability to eat it all before it goes rotten. Luckily though, bananas will hold up well in the freezer. The trick to freezing a banana however is to unpeel them before placing them in a tightly sealed bag. If you forget to peel a banana, you will be forced to thaw out that banana prior to using it. While this is not necessarily a bad thing for some situations, many people enjoy banana shakes with these frozen chunks of bananas. Simply take your frozen bananas, milk and a bit of vanilla and blend in the blender. These are great quick treats without the added sugars. I really like these in the morning while on the way to work. Several shipments of bananas from Costa Rica have been infected with necrotizing fasciitis, otherwise known as flesh eating bacteria. Recently this disease has decimated the monkey population in Costa Rica. We are now just learning that the disease has been able to graft itself to the skin of fruits in the region, most notably the Banana which is Costa Rica's largest export. Until this finding scientist were not sure how the infection was being transmitted. It is advised not to purchase Bananas for the next three weeks as this is the period of time for which bananas that have been shipped to the US with the possibility of carrying this disease. If you have eaten a banana in the last 2-3 days and come down with a fever followed by a skin infection seek MEDICAL ATTENTION!!! The skin infection from necrotizing fasciitis is very painful and eats two to three centimeters of flesh per hour. Amputation is likely, death is possible.. If you are more than an hour from a medical center burning the flesh ahead of the infected area is advised to help slow the spread of the infection. The FDA has been reluctant to issue a country wide warning because of fear of a nationwide panic. They have secretly admitted that they feel upwards of 15,000 Americans will be affected by this but that these are "acceptable numbers". Please forward this to as many of the people you care about as possible as we do not feel 15,000 people is an acceptable number. Year ago, this may have been an email you had received. Luckily for all of us, it turned out to be a simple hoax. While many people would not believe this type of alarming information through a simple email, some people did, and continued to pass the rumor as if they knew it was true. Necrotizing fasciitis, also known as "the flesh-eating disease"; is a real, however rare, illness stemming from an infection from the Group A streptococcus bacterium. This is the same disease that causes your common strep throat and will attack the soft tissues under the skin, resulting in gangrene. While this sounds like a terrible thing, the FDA and CDC both agree that the bacteria cannot live long enough on the surface of a banana to be deemed dangerous. The bottom line is that while the bacteria itself can be deadly, it is not associated with bananas from Costa Rica, or other bananas at this time. This is hoax.